Taiwan in the race of Asian economies with the highest fibre optic penetration - Fibre revenues mostly subscriber-driven and result of carriers' aggressive promotions - Increasing 3G subscriptions and widening demand for smartphones - Mobile non-voice revenues successfully offsetting decline in voice revenues - Smartphone-related applications and software services make Internet access, photo sharing, and messaging more convenient. Manila, Philippines - With a 22% fibre optic broadband Internet penetration (per household, 2Q10), Taiwan continues to be in the race of Asian economies with the highest fibre optic penetration along with Japan (38%), South Korea (34%), and Hong Kong (23%). Fibre access is expected to be the growth driver in Taiwan's fixed broadband segment at an annual average rate of 14% from end-2010 to 2015. Cable modem represents a very small share of the market - little less than 2% average annual growth rate - while DSL revenues are expected to decrease at a rate of 6% within the same period. Fibre revenues have been mostly subscriber-driven and were the result of the year-round aggressive promotions of the carriers. An analyst at InfoCom Manila added: "The country incumbent Chunghwa Telecom (CHT) offered attractive prices and discounts and progressively higher bandwidths as well as expanded coverage areas". In the first half of 2010, fibre had 1.7mn subscribers and accounted for 46% of fixed broadband access revenues during the period, 10 percentage points higher than that of the same period of the previous year. In mobile telephony, with 3G subscribers growing by 13% YoY to 15.4mn in the first half of 2010, non-voice revenues saved the otherwise static segment by successfully offsetting the decline in voice revenues. Non-voice revenues are expected to increase at an annual average rate of 13% over the period 2010 to 2015, in contrast to total mobile service revenues (voice and non-voice combined), which is expected at a virtual growth of 1%. With 3G penetration rate already at 66% (2Q2010), the share of non-voice on total mobile service revenues increased to approximately 15% as a result of increased 3G subscription vis-a-vis a widening demand for smartphones, improved mobile Internet speeds, and affordable data rate plans. CHT, for instance, mainly capitalised on bundling Apple iPhone and HTC Hero with data rate plans. Besides expanding 3G infrastructure to be able to offer better mobile Internet speeds, the operators also focused on satisfying their customers with relevant wireless data applications. 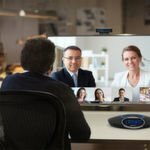 These involve smartphone-related applications and software services that make for more convenient Internet access, photo sharing, and messaging among others. CHT, for instance, launched the Hami Suite, a local iPhone application for information and entertainment. Far Eastone Telecom has its S Mart, a platform where the network's customers can download different kinds of software. Lastly, Taiwan Mobile promoted HTC Tattoo's Android platform and the HD2 Windows Mobile platform and added a content agency business. About this contribution: InfoCom has just released 2010 values and 2015 updated market shares already for a large number of countries. New figures and data are available in Teleseeq, InfoCom's interactive dataroom, available online. Teleseeq is ONE system comprised of the entire telecommunications and related markets with data available for a huge number of services, with split a large number of indicators, by region, country and carrier, for 85 countries and 10 regions, containing forecasts for 5 years over the current year. InfoCom is a market research and consultancy company with over 20 years experience providing strategic analyses and planning assistance to stakeholders in the telecommunications, IT and multimedia industries. InfoCom's independent and fact-based analyses highlight trends and opportunities, supporting decision makers to understand market dynamics in order to improve their competitive advantage. 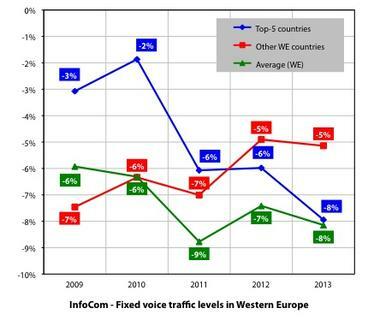 InfoCom illustrates how some carriers managed to mitigate fixed voice erosion in Western Europe. [PDF] Press Release: InfoCom says fibre-based broadband and mobile Internet emerge as growth drivers in advanced Taiwanese telecoms market.